In this episode, I interview Andrew Foxwell. He’s a Facebook ads expert who runs Foxwell Digital, an agency for direct-response eCommerce brands. He’s built and run numerous trainings for Jon Loomer and co-hosts the eCommerce Influence podcast. Andrew explains how Facebook Analytics compares to Facebook Insights and Google Analytics. You’ll also learn how Facebook Analytics helps you analyze funnels and the lifetime value of a customer. 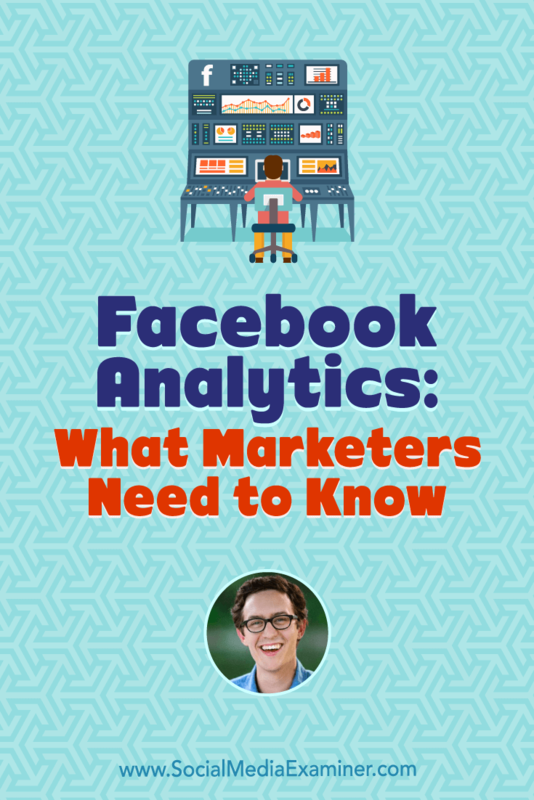 Facebook Analytics: What Marketers Need to Know featuring insights from Andrew Foxwell on the Social Media Marketing Podcast. After college, Andrew worked as a Windows server engineer but realized that type of work wasn’t for him. In 2008, he volunteered for a congressional campaign, where he worked on the candidate’s website, among other things. After the candidate won the election, Andrew went to Washington, D.C., where he worked on the congressperson’s press, Facebook page, and Twitter. As part of Andrew’s work in D.C., he also worked on new rules for members of Congress so they could use their official funds to advertise on social media. Before that, members could only send glossy mail pieces. After the rules changed, candidates could run ads that said, “Like my page to learn more about my economic policy,” and things like that. After continuing to work with members of Congress through another company, around 2013, Andrew became director of social at 3Q Digital in San Francisco. There, he worked with brands like GoPro, Fitbit, Eventbrite, and Square. Soon after he started that job, Facebook announced the ability to run ads in the Facebook news feed; whereas before, ads appeared only on the right. Seeing the full arc of Facebook advertising and its development has been an interesting experience. Andrew believes it’s become much more effective for advertisers. Now we’re in an age of transparency with Facebook advertising, which is fantastic. 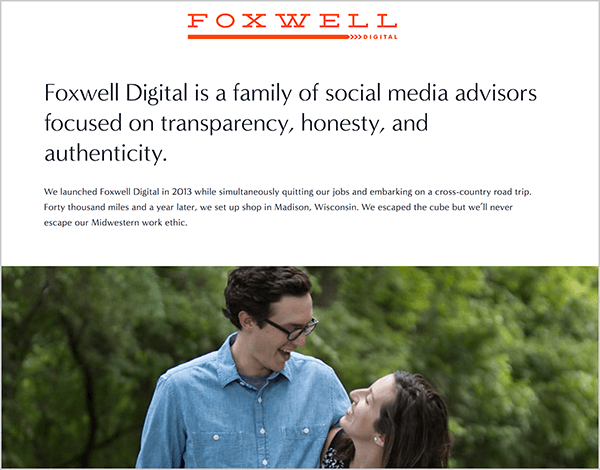 Today, Andrew runs Foxwell Digital, where he and his wife help people understand how to build a social direct-response program and make sure it’s lucrative. He also stays on top of new social advertising features and capabilities, which is how he found Facebook Analytics. In fall 2017, after playing around with Facebook Analytics for a month, Andrew called John Loomer and said they should create a program about it right away. Their program began running in December 2017. Andrew is interested in Facebook Analytics because it begins connecting a lot of dots for people. Listen to the show to hear Andrew discuss his work with the internal Facebook Analytics team. To introduce Facebook Analytics, I ask Andrew to explain what it is and how it’s different from Facebook Insights and Google Analytics. Andrew says Facebook Analytics, at its core, allows you to see how your Facebook properties connect. For instance, you can see how audiences for your Facebook page and Facebook pixel connect or overlap. You also see how people interact with your website. Because Facebook pixel is a core component of Facebook Analytics, you can see how people travel through your site and interact with different parts of Facebook events. 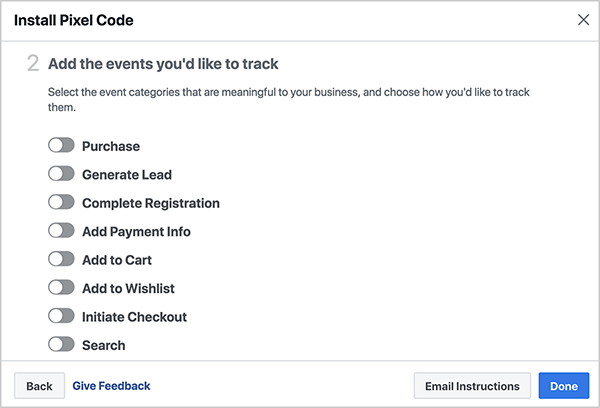 As an example, Facebook pixel has a purchase event, a lead event, and other events you can customize. Facebook Analytics gives you an idea of how these interact. You’ll find Facebook Analytics in Ads Manager or Business Manager (click the menu in the upper left, select All Tools to see all options, and click Analytics in the Measure & Report section). Within the Analytics tool, you can build graphs that aggregate page data in big-picture ways, whereas Facebook page insights relate to reach, post performance, and other micro-level statistics. In other words, Facebook Analytics pulls together the micro-level data from your Facebook page and Facebook pixel in ways that allow you to see how someone interacts with your page and website over time. To visualize this, you can see how many people commented on a post and later viewed your page and then made a purchase. Andrew then discusses how Facebook Analytics is different from Google Analytics. Google Analytics is a comprehensive tool that enables you to look at more data than Facebook Analytics and do deep dives into specific pages. Facebook Analytics is best at showing you interactions among events so you can see opportunities that you maybe didn’t know were happening. Say women in the 35-44 age bracket are making a purchase 11% more often than men of the same age. Facebook Analytics gives you automated insights like this that you don’t necessarily get from Google Analytics. Each tool has benefits, and Andrew thinks they work really well in tandem. Listen to the show to hear my initial impression of Facebook Analytics. For the easiest, most basic way to start using Facebook Analytics, simply open the tool and select your Facebook pixel. The pixel starts giving you a lot of interesting data and is a great starting point. The next thing you can do is to create an event source group (ESG), which pulls together disparate properties. In addition to connecting your Facebook page and Facebook pixel, you can also create a more complex ESG that includes more data sources. 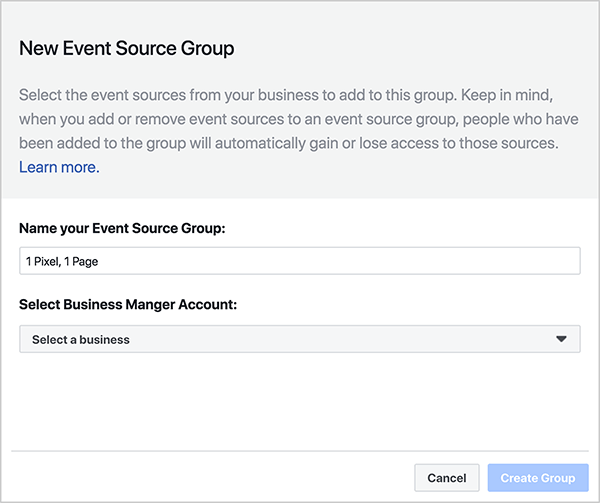 Say your event source group includes a Messenger bot, your Facebook page, and your Facebook pixel. The dashboard shows real-time aggregate data of all of these things, and you can use tools to see more specifically how they interact with one another. You can also name the ESG so you can search for it in Facebook Analytics. With the Facebook Analytics ESG, the main value proposition is that you can truly see the return on investment (ROI) of your Facebook page and other elements of your social marketing. For instance, you can see how engagements on Facebook, such as comments on a post, connect with purchases on your website. When Andrew has looked at this connection for certain clients, 10%-15% of all people who engage later add something to their cart or initiate a checkout. That’s a huge ROI that you can share with a client and use to further prove your worth. Similarly, Jon Loomer used Facebook Analytics to determine how types of Facebook page reactions converted. He found that if a person loved a post, they were going to become a lead. Before, you could see whether your content was getting good engagement, but Facebook Analytics gives you a better idea of the value of that engagement. However, when you connect your page and pixel data via Facebook Analytics, it doesn’t pull in your ad account data directly. Although the ad account data will show under the pixel, you can’t directly connect events like initiating checkout or making a purchase to ads. Your ads might fuel these events, but you can’t yet see the extent to which they do so on a Facebook Analytics dashboard. 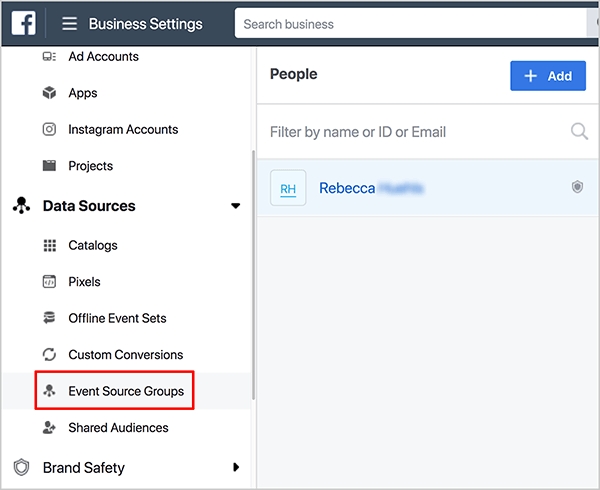 If you use Business Manager, you can share ESGs so other people in your business can access Facebook Analytics data. After you create an ESG, you can share it via Business Manager. First, open Settings, click Data Sources in the left-hand navigation, and then click the Event Source Groups option. From there, you can add people to your ESGs. When the user you’ve added opens Facebook Analytics, they’ll see the data populated with the information you gave them permission to access. 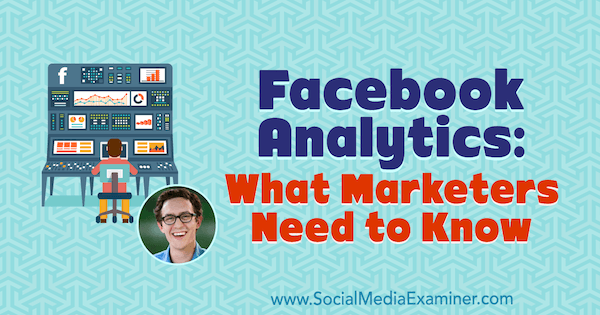 Listen to the show to hear Andrew predict what features might be added to Facebook Analytics. Facebook Analytics creates the Overview dashboard automatically, and it shows you ways to take action right away. At the top, you see the number of new users, the number of unique users, and your retention rate (the percentage of people who return to your site). Under Growth Metrics, you see how many active users you’ve had over the past 24 hours and your best traffic sources. If you use Google Analytics, note that some of the numbers in Facebook Analytics are slightly different. To illustrate, the number of users might be different, and the way Google defines a user in a session is different from the way Facebook Analytics defines it. Other than these small discrepancies, the numbers should mostly line up. Also, based on the type of dashboards you see in Facebook Analytics, unique users seems to be a very important number. Listen to the show to hear my thoughts on what Facebook and Google know about their users. 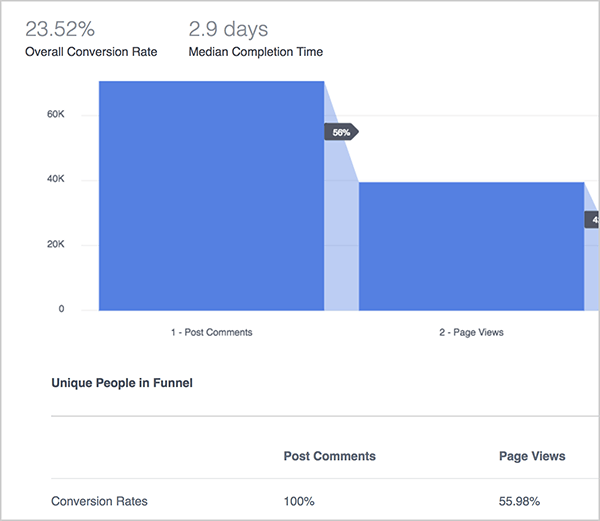 To see the Funnels dashboard, you click Funnels on the left side of the Facebook Analytics interface. On this dashboard, you build visual paths within your sales cycle to see how different parts of your funnel relate to one another. One of Andrew’s favorite funnels analyzes how a page view, add to cart, and then purchase work within a 60- or 90-day timeframe. To build your own funnel, click Create Funnel and select each event you want to include in sequential order. When you add a funnel step, a drop-down menu gives you options like conversations, messages sent, page views, post reactions, add to cart, and so on. You’ll see all of the events that relate to the items in your ESG. The information on the Funnels dashboard can help you identify ways your ads can improve the funnel. For example, you might try to improve the percentage of people who view a page and then add something to a cart. To do that, you could try making the offer on an ad with the conversion objective a little more enticing. Or if you want more people to add items to their cart, you could launch an ad with a page post engagement objective and an audience of people who have viewed your page but didn’t add to cart. You can also decrease the rate at which people drop out of your funnel at each stage. Say you’re losing a lot of people on the landing page. You might change that page a little bit. Or if people drop off when they add the item to the cart, you might need a link to frequently asked questions or a live support agent. The Funnels dashboard also shows you the median completion time so you can better understand how the timing of your funnel works. To visualize this, Andrew had a client with a median completion time of 21 days because their product was expensive. This helped them understand that their 7-day funnel wasn’t working because it wasn’t long enough. For another client, the median completion time was 1 hour, which showed Andrew that the funnel did a good job of convincing buyers. The Funnels dashboard also shows lots of other information that can help you analyze your funnel, including the number of unique people in the funnel, the events in your funnel, how many events per person, the conversion rate, and value (if your revenue is tied to your Facebook pixel). Another metric Andrew finds especially interesting is the completion time for each step in the funnel as a percentage of users. As an example, how quickly did your top percentage of users take an action in your funnel? The percentages are divided into the top 25%, 50%, and 75% of users. With these numbers, you can see how quickly your best customers or best new customers took an action. To illustrate, Andrew has a client whose top 75% of users has a median completion time of 2.4 days, whereas the client’s top 25% of users do the same thing in 18 minutes. To improve this funnel, you can focus on what you might do to improve the time for that 75% of users. For the Funnels dashboard to work, you need to make sure your Facebook events are set up properly. If you don’t have an eCommerce site, events you might want to log include a user submitting a lead form or registration. Facebook pixel logs page views by default. You must set up other events yourself. To see secondary or tertiary parts of an event, you must customize it. The easiest place to manage pixel events is in the Pixels area. In Ads Manager, you’ll find the tool in the Measure & Report column. On this screen, you can see the pixel event customization. For instance, you can customize the pixel to trigger an event when a user clicks a button. Review this setup yourself or send it to your developer. Typically, B2C businesses track different events than B2B businesses. For B2Cs, common events include page view, initiate checkout, add to cart, and purchase. B2Bs tend to track lead events, registrations, and site searches. For example, you can see how many people search for something on your site, get an answer, and then add an item to a cart or take another action. You can also create custom conversions. Unfortunately, custom conversions don’t display in Facebook Analytics right now. 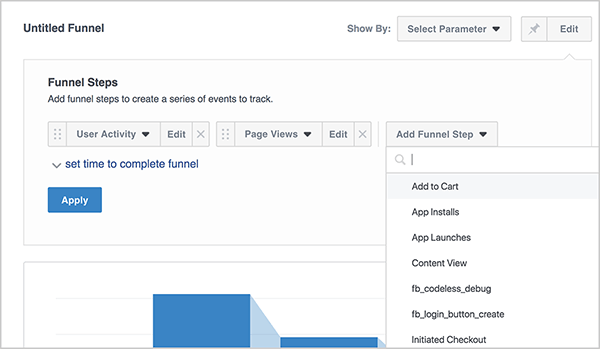 To analyze how events progress in the Funnels dashboard, you need to make sure your funnel mostly uses standard events. Listen to the show to hear Andrew discuss managing events with Google Tag Manager. As ad space in the Facebook news feed becomes more competitive, the cost per acquisition (CPA) or cost per lead is rising. With these rising costs, you might need a way to justify a higher cost per acquisition. Say you’re selling a $75 product and you want the ability to spend $20 per customer on acquiring buyers. In this challenging environment, customer lifetime value (LTV) is a useful angle. This point is especially important for the many Facebook advertisers who don’t target existing customers. If these customers have already bought from you and you sell a great product, they’re probably happy with you. Thus, Andrew suggests targeting people who made a purchase or maybe even joined your email list. In this way, you can raise customer LTV, and Facebook Analytics has a Lifetime Value dashboard that helps you see this data. It even lets you adjust the customer LTV for a certain timeframe. Narrow the timeframe and the average customer order might be $40. But if you extend the timeframe to 90 days and target your previous customers and email list, you might increase LTV to $75. You can analyze LTV in other ways, too. A graph shows how LTV has changed over time for a cohort of users. You can see the average LTV, as well as the week-by-week LTV. The weighted average relates the number of people in the cohort with the amount of conversion, and you see how that number changes. Andrew thinks weighted average is the most statistically accurate analysis. In a graph color-coded to highlight the most valuable weeks, you can see at a glance how LTV corresponds to changes you’re making in targeted ads, promotions, and so on. I ask how you know what customers or groups Facebook Analytics shows on this dashboard. Andrew says you see users who are connected to your ESG in any way, although the data is all anonymized. If you’re looking only at your Facebook pixel, you see only pixel data. If you’re looking at the pixel and Facebook page fans, then you see users who belong to either of those groups. 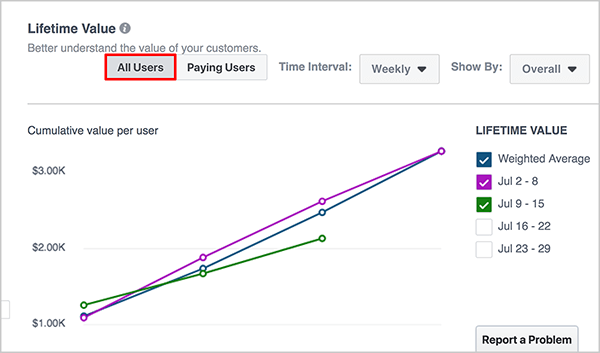 Although you might have an accountant or accounting department that calculates customer LTV, the Facebook Analytics Lifetime Value dashboard tells you how those customers developed over time. 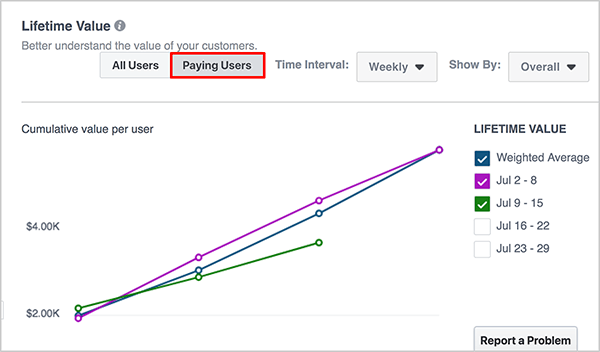 You can also easily toggle between a graph of all users or paying users. To visualize this, you can see a cumulative value per user that includes everybody who has interacted with any of your properties (such as your page or pixel). Or you can see a value that includes only paying customers, so the graph measures only those users who converted and how that group developed over time. To see the financial data on the Lifetime Value dashboard, you have to customize your Facebook pixel. Or, if you use a service like Shopify, it will automatically do it. After you have the data in place and understand how the Lifetime Value dashboard works, it can help you determine your Facebook ads budget and how you think about your customer over time. Maybe in May, you spent $10K and made $30K. However, the Lifetime Value dashboard might show you increased LTV from $150 to $180 by targeting people who made a purchase. I then ask how Facebook determines whether to attribute a conversion to a Facebook event. Andrew says Facebook’s default attribution model is a 28-day click and 1-day view. So if you click an ad that takes you to a landing page and then return to the site to buy something up to 28 days after that click, the purchase will count as a conversion. Although this time period seems long, it reflects how people actually make purchases. People rarely click an ad and make a purchase. Instead, they might click a Facebook offer, think about it, maybe see a follow-up ad on Instagram, and make a purchase 7 days later on their desktop. Similarly, if a user views an ad and makes a purchase within 1 day, that purchase counts as a conversion, too. Also, you can develop your own attribution models. Your model might attribute a purchase within 7 days of a click instead of 28 days. Listen to the show to hear more about the benefits of the Lifetime Value dashboard. Just as you can create reports and dashboards in Google Analytics, Facebook Analytics lets you do something similar. After you customize a graph in Facebook Analytics, you can pin it to a dashboard. You can then name the dashboard and share it with a client via a URL. With a customized dashboard, you can slice and dice the data in all kinds of ways. For instance, you can create a dashboard that compares specific events. You can look at different cohorts of users, and see how a segment of users is converting or viewing a page on your website. Over time, you can then see whether traffic is going up or down. The time windows are customizable, too. Listen to the show to hear Andrew explain why for him, Facebook Analytics is more intuitive to use than Google Analytics. With Facetune 2, you can touch up selfies right on your mobile device. After you take a selfie, the editor can whiten your teeth, make your eye color pop a little bit, and remove blemishes. However, this app doesn’t make major changes, like changing the direction you’re looking. You can take a photo with the app camera or upload a selfie you’ve already captured. 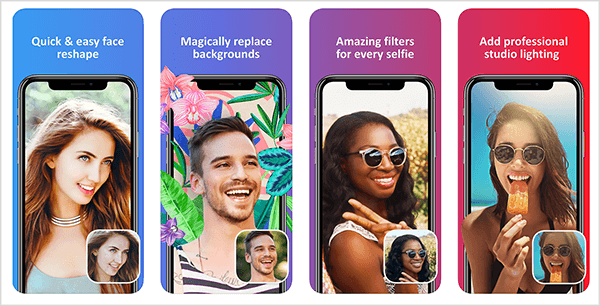 Facetune 2 is free to start, and many of its tools are in-app purchases. The app is available for iOS and Android. Listen to the show to learn more about Facetune 2 and let us know how it works for you. Learn more about Andrew at the Foxwell Digital website. Listen to the eCommerce Influence podcast. Discover more basics about Facebook Analytics. Read how Jon Loomer used Facebook Analytics to determine how different types of Facebook page reactions converted. Find out how to make sure your Facebook events are set up properly. Retouch your selfies with Facetune 2 for iOS or Android. What do you think? What are your thoughts on Facebook Analytics? Please share your comments below.